Hyundai has lifted the veils off its new hybrid dedicated GDI engine and front-wheel drive 8-speed automatic transmission in Korea. Announced at the company’s annual International Powertrain Conference, the new 1.6-liter GDI engine will be used on future Hyundai hybrid models and will most likely debut in the Korean automaker’s Prius rival. The new Kappa 1.6-liter GDI engine is designed to boost power, performance and fuel economy, while driving down production costs and CO2 emissions in the mid-class hybrid electric vehicle (HEV) and plug-in hybrid electric vehicle (PHEV) segments. Arriving in markets in early 2016, the new unit marks Hyundai’s first combination of the Atkinson cycle, cooled exhaust gas re-circulation (EGR) and a long stroke specification to maximize thermal efficiency. Thanks to these features, the new Kappa HEV engine alone delivers a 3 percent gain in fuel economy and achieves an increased engine thermal efficiency of 40 percent. The engine is rated at 105PS (104hp) and 147Nm (108lb-ft) of torque. Hyundai has also presented its new front-wheel drive 8-speed automatic transmission, which delivers improved fuel economy by 7.3 percent when compared with the existing 6-speed automatic transmission unit. 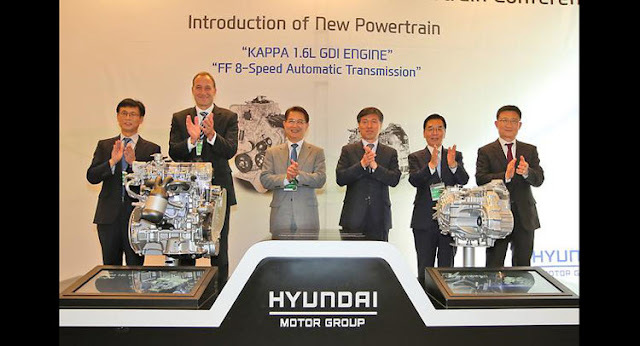 Promising better drivability and smoothness, the new transmission will be offered for Hyundai’s Lambda, Theta turbo GDI, and R family engines, targeting the large and luxury car segments. Based on a unique layout, the new transmission has an additional clutch compared to the 6-speed automatic transmission. By increasing the gear span with a more number of gears, the transmission offers improved acceleration performance at the low gear range, and enhanced fuel economy and NVH at the high gear range. The weight has also been reduced by 3.5 kg (7.7 lbs) from the 6-speed automatic transmission.